The Woods Kangee is designed by Ryan Johnson of RMJ Tactical to make your life easy when you're off the grid. The design for this t-hawk evolved from the original Kangee Tactical Tomahawk. 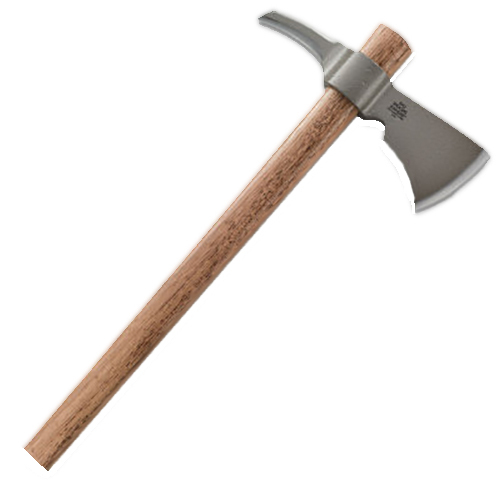 The Woods Kangee has a solid chunk of 1055 carbon steel that is hot forged into a rock-solid head and features a hammer finish. The t-hawk has primary and secondary edge bevels that are flat ground to cut through timber like an Oregon beaver. A spike on the opposite end splits ultra-tough wood knots like a boss. The thick wood handle is made in the USA from Tennessee hickory. It's comfortable in hand and sealed with a lacquer coat that adds durability when you're in the backcountry.